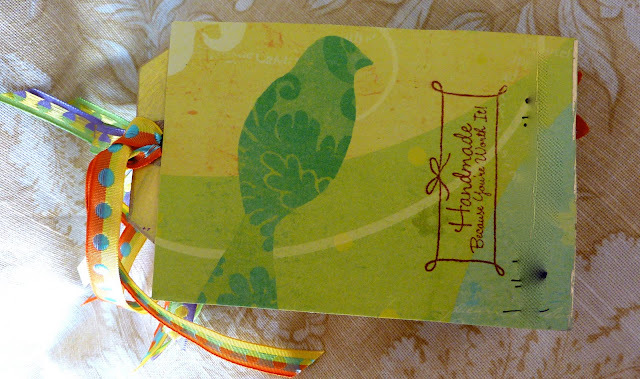 I added some embellishments and more stamps on the first little book and it's complete. The second book, I think I like better because it is at least somewhat 'useful'. It's called 'Notes to Myself'. In each pocket I have placed a tag. Each one has a title for a list you may wish to make. i.e., Ten Things That Make Me Happy, Ten Things I Treasure, Ten Things I Want to Give Away, Ten Things I Want to do I have Never Done Before, Ten Places I Want to Go, etc. etc. Just a little more interactive and a little more fun. Also places you can write more notes. I made the book out of envelopes, however, being in Mexico, I didn't have the proper size envelopes. The flaps on the inside of the book are imobile because of this. A third book for the swap? I think so ... If I can just get through this heat wave! Don't laugh at my quote today --- this heat makes my brain go a 'little funny'. These are so inspiring... love all the wonderful color.